Gumbs Orthopedic Medical Group provides medical-legal evaluations for injured workers under the Workers' Compensation system. Our Board Certified physician fully understands the communication process between the injured worker, attorney and the insurance carrier. When an accident occurs, an initial medical examination needs to be performed by a doctor of the injured person. As an IME - Independent Medical Examiner, we are fully qualified with the medical knowledge and training in med-legal evaluations. We have years of experience and training, with credentials in the area of IMEs. A medical consultation takes place between the employee and licensed physician to determine the examinations or procedures, if any, that are appropriate. Medical consultation is important because it is the main opportunity for the doctor to explore the patient’s problems and concerns identifying the cause and result of their issue. Medical treatment is the management and care of a patient to combat a disorder. There are various types of medical treatments which include administering prescription medications, over-the-counter drugs, wound closing devices such as surgical glue, sutures and staples or any devices designed to immobilize parts of the body. Staff efficiency in expedited appointments, availability and flexibility. All exams are performed by a Board Certified physician. Professional and efficient expert examination. Impartial, valid and objective documentation. All statutory constraints, deadlines and regulations mandated by Workers' Comp and Liability exams are adhered to. Clear concise reports based on the AMA Guides for the Evaluation of Permanent Impairment, Fifth Edition. All reports will be faxed or e-mailed upon request. Vincent L. Gumbs, M.D., F.A.A.O.S, F.A.C.S., Q.M.E. is a board certified orthopedic surgeon as well as a fellow of the American Academy of Orthopedic Surgeons and American College of Surgeons. He specializes in nonsurgical solutions to orthopedic disorders. Dr. Gumbs’ practice in Encino is directed principally towards providing medical-legal evaluations for injured workers under the Workers’ Compensation system. He has over thirty years of experience in providing quality care, evaluations and treatment. Dr. Gumbs understands the communication process between the injured worker, attorney and the insurance carrier. 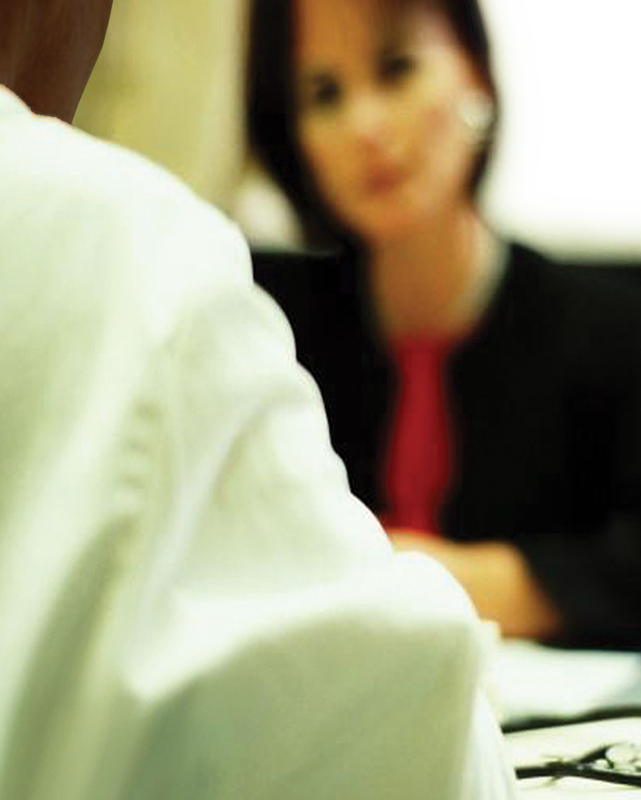 He is skilled in report writing thereby ensuring that acceptable legal and medical standards have been met. He is well versed and remains current on important Workers' Compensation laws and case rulings. 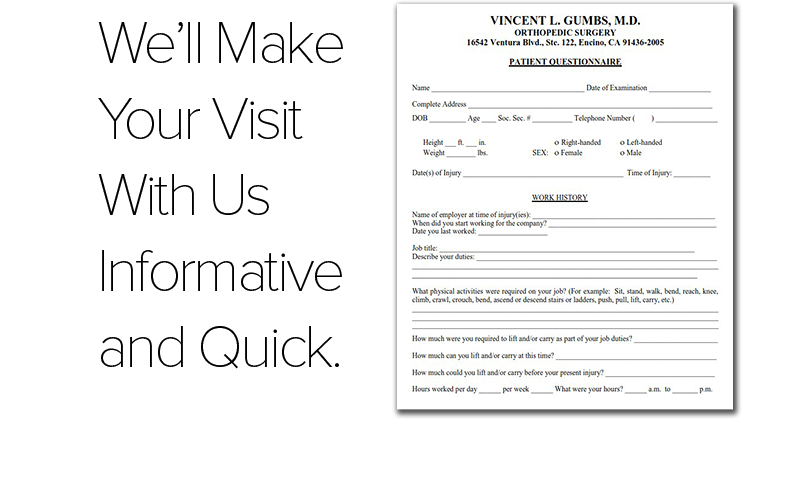 Please download and fill out Patient Forms before coming into our office to make your office visit faster. Just print out the forms, fill out all the information, and bring it with you along with any other necessary forms and X-Rays. on Ventura Blvd. in the San Fernando Valley. For more information about Gumbs Orthopedic Medical Group, please call us or send us a message. 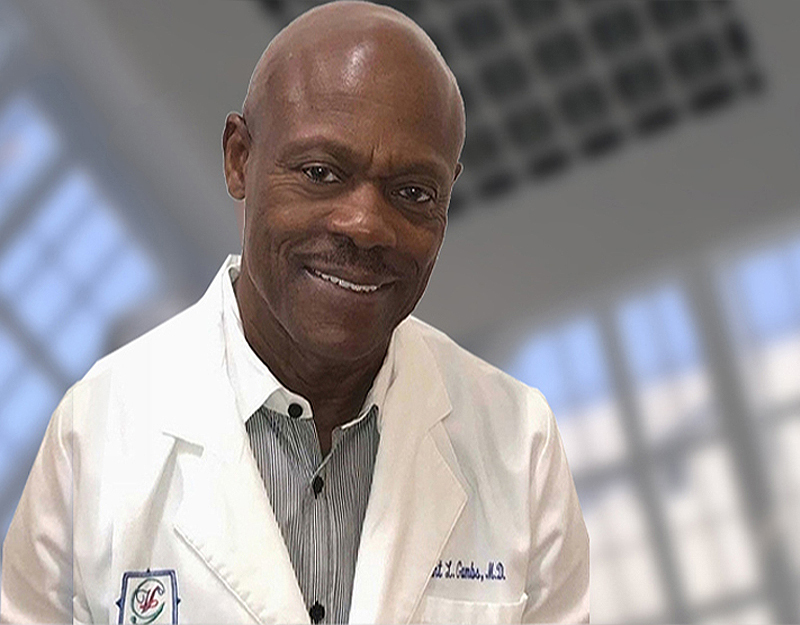 For over 30 years, Board Certified Orthopedic Surgeon, Dr. Vincent Gumbs has provided medical-legal evaluations, medical consulting, and treatment for injured workers. He is well-versed and remains current on important Workers' Compensation laws and case rulings ensuring that acceptable legal and medical standards have been met. Copyright © 2017 Gumbs Orthopedic Medical Group, Inc. All rights reserved.